SUMMARY: Sixteen-year old Daire travels the world with her mother, a make-up artist for Hollywood's elite. But one night on-location in Morocco, Daire has her first vision, one of floating heads that whisper to her. Daire, her mother, and her doctors fear the worst: that Daire is slowly going crazy and can only be controlled with strong drugs. But when Daire goes to live with her estranged grandmother, she finds out she is has been having the same haunting dreams and surreal experiences that led to her father's untimely death. REVIEW: I surrender! I just can't read one more page. For the first time EVER, I am giving up on a book and still publishing a review. I don't normally do that because I think it isn't fair to review a book I didn't finish, but in this case, I feel that I got far enough (197 pages) to review it with detail. There really was a lot I did not like, but to be fair, let the record show that I only completed 2/3 of the book. In the unlikely event that the last 100 pages feature a complete turn-around and it transforms into an action-packed, page-turning thriller, then please, someone let me know. 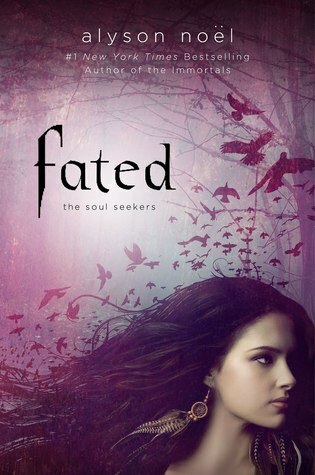 With a giveaway of Fated going on last week on my blog, I really wanted to like Fated. I was hoping I would be able to write a 4- or 5-star review, and everyone would be scrambling to get their hands on an autographed copy. Alas, I cannot honestly recommend it. I feel pretty bad about that because the publisher was so nice to sponsor the giveaway. The cover is gorgeous (can I PLEASE have those earrings? ), and the premise of a girl who dreams of a world between life and death really sounds interesting. So WHY couldn't I like it? For starters, I had the hardest time getting into Fated. The story is difficult to follow, and I was never really 100% sure why Daire needs to fight Cade and the Richters. Are they planning to kill someone? Take over the world? What is their "evil plan," other than to kill Daire, the last of the Soul Seekers? If they killed Daire, what then? The characters hover somewhere between so-so and completely unlikeable. Daire, yet another YA heroine who is devastatingly beautiful and doesn't know it--ugh--whines excessively and constantly feels sorry for herself. She argues with her poor mother often, even as her mother really loves her and is trying her best. The constant bickering with her mother may be realistic, but it doesn't do Daire's character any favors. Paloma and Chay are unique, but what kept Paloma out of Daire's life for 16 years? Wouldn't it have been much easier for Daire if she knew at age 16, she might see her dead father's severed head talking to her? I got pretty tired of the whole "I'll tell you later" and "You'll find out later" stuff from Paloma. This girl is kind of dealing with a lot--could you please give her some kind of real guidance? Daire knows enough information to ask the question; the least Paloma could do is give her something to go on. The wooden romance barely has any spark. Dace and Daire don't even physically meet until more than halfway through the book, not that it really matters since, like Daire, Dace has no personality at all. And I got so sick to death of hearing about Dace's "glossy black hair." Do we really need to hear about it every time he appears in the story? And of course, it wouldn't be a YA paranormal romance without the "insta-love" that makes me so crazy. Noel's writing style is descriptive, but it is seriously long-winded. Routine activities such as eating a hamburger, driving a long distance, crossing the street, and entering a high school take several paragraphs to describe. Nothing really happens in these scenes other than Daire eating or sleeping or walking, so I am not sure why Noel devotes so much time to them. For me, it bogs down the too-sparse action scenes, which were just interesting enough for me to keep reading (slowly, falling asleep after only a few pages). It took me two weeks to finish 197 pages of Fated, and that was only because I "staggered" it with three other books I was more interested in. I tried really hard to finish, but I can torture myself no longer. THE BOTTOM LINE: Disappointed. As much as Fated has going for it, it wasn't for me at all. STATUS IN MY LIBRARY: I'm neither here not there with this one. If students request it, I'll consider it. The only content I am concerned about for MS students is that intense kiss right at the beginning of the book (just before Daire sees the floating severed heads). Engrossing: 1/5--helped me take two naps in the same day! Appeal to teens: 3/5--They might like it better than I did. So sorry you didn't like this. After the Immortal series I was hoping this would be good too. I'll have to think about this one. Thank you for your review.